Continuously diversifying my blog . 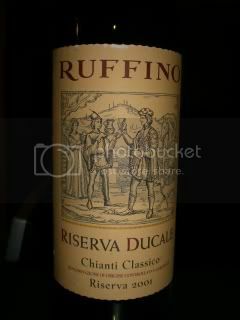 . .
Ruffino, Riserva 2001. Direct from Italy . . . and it can go back. I see this wine all over the place, so I finally decided to give a go. Never again. I found it to be bland and, well, just bla (especially for the price). Not much else to say about it really. 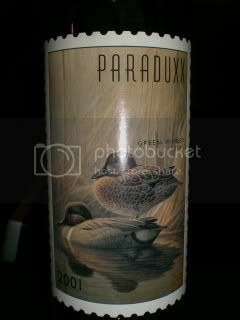 Ah, Paraduxx, 2001 Napa Valley. Aside from the whitty name this wine really does shine with aromas of cherry and roses. I have honestly never tasted roses in a whine. Something unique? perhaps, but more likely my ever-evolving palate. Give this cab-zif a try if you get the chance. I have had that wine all over the world and find your revue odd. Maybe it was left in heat or your wine store didn't store it properly as I have never had a bad bottle, whether in Roma, Athens or LA. Your other choice is good and the year quite nice. Lately we have been buying a lot of 2 Buck Chuck at our local Trader Joe's, cheap and very tasty, this includes their Merlot, Cab, Chardonnay and Pinots! I did a blind taste test with a winesnooty neighbor and he loved them.